4 Camera IP Surveillance System withh 3 MegaPixel Dome Cameras, Outdoor/Indoor, with NightVision. Plug&Play Installation. Introducing Platinum Series IP Surveillance Systems with 3 MegaPixel IP Cameras. Real Time High Definition Recording on every channel. Package includes everything you need to setup High Definition CCTV System at your home or a business. Setting up IP camera system was always consider to be difficult. Installer had to be familiar with networking in order create a network for the cameras and NVR. With our new revolutionary IP CCTV packages installation is as easy as plugging all the cables in the back of the NVR and connecting cameras on the other end. Our NVR with a built-in Gigabit PoE switch will detect cameras automatically assigning IP addresses and creating a working network environment. Our Platinum Series NVR is easily accessible from any mobile device like phone or tablet as well as any computer. You can monitor your valuables live or play stored video from anywhere in the world as long as you have an internet access. NVR is capable of Real Time High Definition Recording on every channel and with a built-in 1 Gigabit Switch, there is no delay in the video. With PoE feature there is no need for a separate power supply for cameras. One ethernet cable will power the camera and transmit a video. You can connect this system to any High Definition TV using HDMI Cable or a computer monitor using VGA Cable. You will love Easy to use Graphic User Interface. You can operate NVR with a mouse and even without prior experience it doesn't take long to get familiar with all the features. This system can record on motion only saving you storage space and time when retrieving a video. You don't need to fast forward trough hours of video. You can set cameras to record on weekly schedule as well, or just record continuously. Vandal Resistant and Weather-Proof Dome Cameras are great for Indoor and Outdoor use with a Infrared Night Vision Cameras operate even in full darkness. You can select from 2 types of Lenses. 2.8mm or 4mm. 2.8mm is a very wide angle lens and recommended for cameras mounted low (under 12ft) One the picture above 2.8mm camera is mounted 11ft high. 4mm Lens is not as wide as 2.8mm but will work better when camera needs to see farther or is mounted higher (above 12ft). Do you need to monitor more than one location. Maybe you have multiple business location? Do you want to see your home and business when away? With CMS software you can monitor multiple sites all with just one program and all on one screen. Now you can be in many different places at a same time. Do you need just 4 Cameras for now but you think you may need more in the future? Upgrade NVR to 8 Channel or 16 Channel Model using drop-down options above. 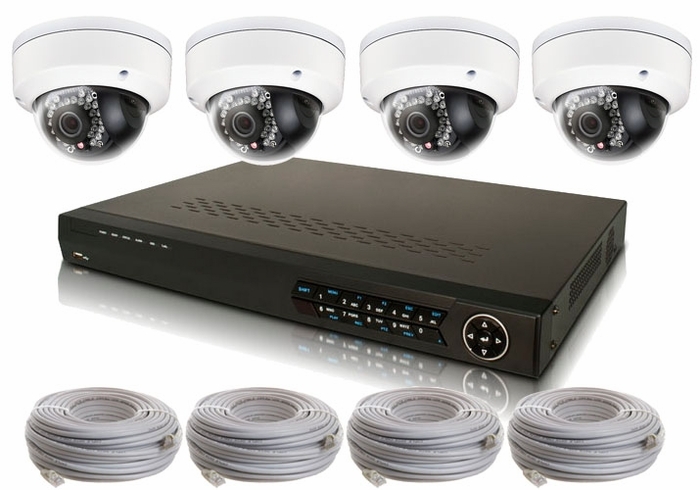 Whenever you are ready just purchase additional cameras and cables and expand your CCTV System. Connectable to network cameras with up to 5 Megapixels resolution. Support live view, storage and playback of video at 5 Megapixels resolution. 4 independent PoE network interfaces are provided. Zoom in for any area when playback. Digital zoom in live view and playback mode. 4CH simultaneous playback at D1 resolution. Searching record files by events (alarm input/motion detection). Dual system design ensures high reliability and stability. 1 self-adaptive 10M/100M/1000M network interface. TCP/IP protocol, PPPoE, DHCP, DNS, DDNS, NTP, SADP, SMTP, SNMP, NFS, UPnP and iSCSI are supported.